Looking for a CBD vape to love? 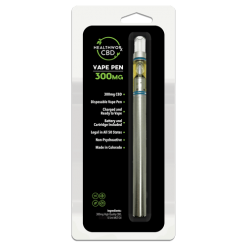 Our CBD vape pen is a great option. Using a Pineapple Express vape pen provides a unique set of benefits to the consumer. 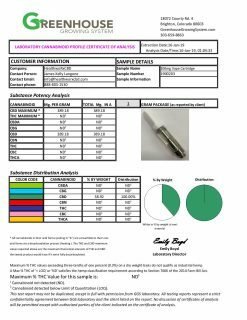 You can purchase a CBD vape pen cartridge from our site, where we offer a wide selection when it comes to the CBD vape cartridge category. Want to learn more about our Pineapple Express vape pen? Keep reading! We’ll explain the benefits of using a CBD vape pen (over other methods of taking CBD), provide our insight on buzz words like THC free and bioavailability, and give you all the details on our popular Pineapple Express vape pen. 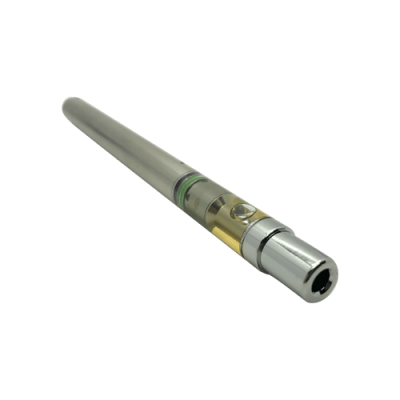 THE PINEAPPLE EXPRESS VAPE PEN IS ONLY FOR CUSTOMERS AGE 21 OR OLDER. The CBD vape pen comes ready to use with no need to charge it up first. Each CBD vape is good for up to 200 puffs. 100% FREE of THC, PG, VG or MCT Oil. 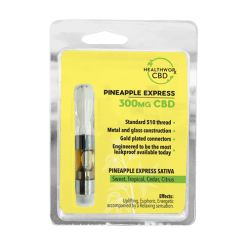 Our Pineapple Express CBD disposable vape pen is the newer and safer way to get your dose of CBD. 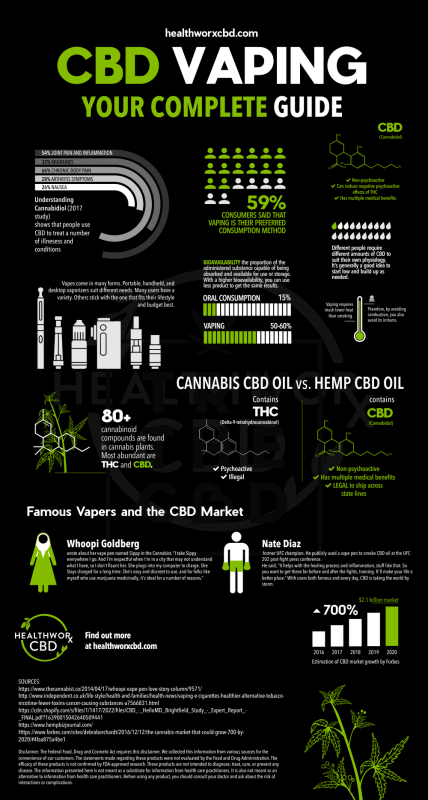 Vaping is also the most efficient way for the body to uptake CBD. To learn more on that, see the section on Bioavailability below. What could be more convenient? Pure CBD is ideal for medicinal purposes because it doesn’t impose psycho active effects on the consumer. What it does do is relax and soothe you without making you feel high or stoned. Vaping or dabbing is the process of consuming CBD using a vape pen. Vape pens sort of resemble cigarettes, but do not contain nicotine and do not burn or smoke the substance inside. In fact, scientific studies prove that vaping is at least 95% safer than smoking. In addition, it combines portability and vapor into one easy to use device. Our 300 mg CBD disposable vape pen is formulated using “the good stuff” — also known as high quality CBD, Tec Temper and natural flavorings. 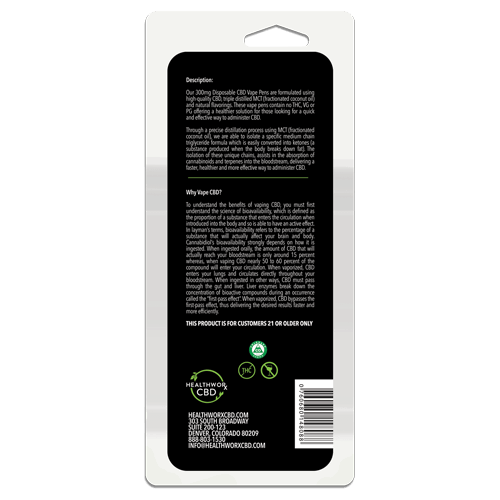 Each CBD vape pen cartridge is disposable, or one time use. 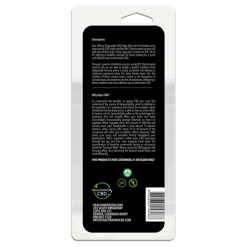 Our CBD disposable vape pen does not contain THC, VG, PG or MCT Oil. 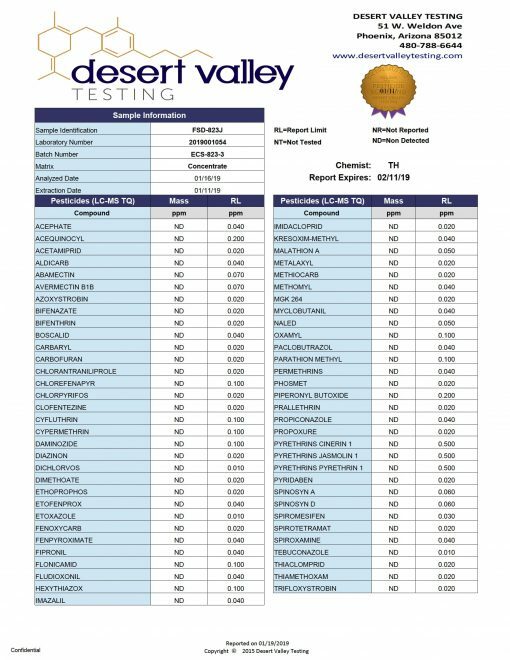 By using Tec Temper, we can offer a healthier solution for those who desire the convenience and efficacy of vaping CBD. This, in turn, makes it a faster, healthier, and more effective way to administer CBD. The ingredients of our CBD vape pen are simple. 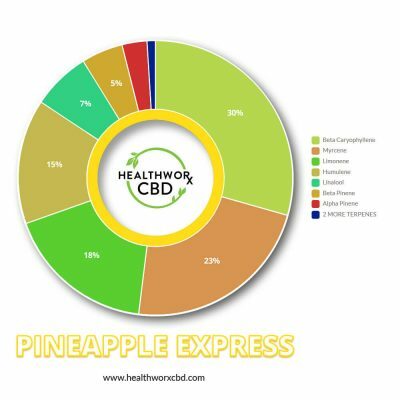 Each Pineapple Express CBD disposable vape pen contains just 300 mg of CBD mixed with TEC TEMPER and, in this case, Pineapple Express terpenes. That’s what makes it a great Pineapple Express vape pen. 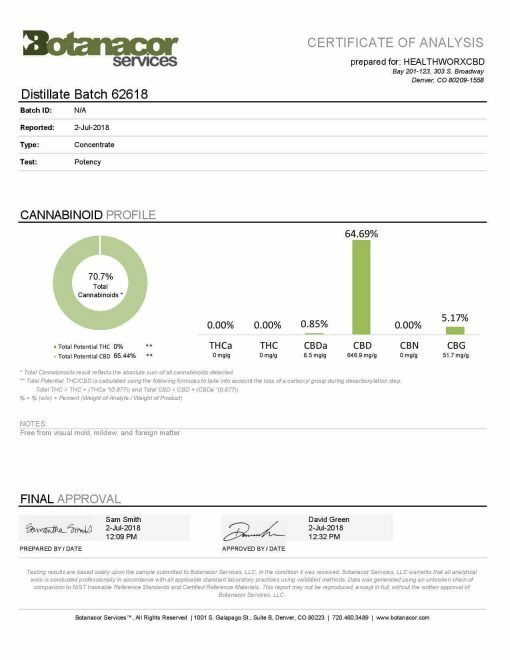 Our CBD disposable vape pen contains a CBD distillate that has 0% THC. But what is THC, exactly? And what does that mean for you as the consumer? 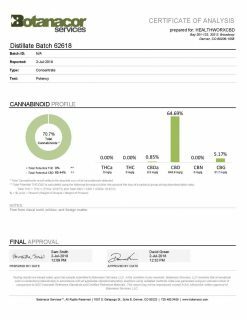 Here’s the basics of what it means what a CBD product is labeled as THC free. Essentially, any plant that belongs to the cannabis family of plants is packed with chemicals that are called cannabinoids. In most plants, there are over one hundred different cannabinoids, but they all occur in different percentages and all have different effects. However, the two most popular and well known cannabinoids are also the most prevalent and abundant in the cannabis plants. These two cannabinoids are CBD — which is what are vape pens consist of — and its cousin THC. THC is the one that’s responsible for the psycho active effect of cannabis, or the part of the plant that gets you high. So THC is what makes marijuana illegal in some places. But marijuana products that do not contain THC are not illegal because they do not have any sort of psycho active effect. THC free products are very popular among consumers for these very reasons. Not only are they not subject to any sort of legal complications, they also do not have the side effect of making you high. For many people, especially those who want to use marijuana products in a therapeutic or medicinal way, this is ideal. If you’re looking for products that come from the marijuana family of plants but do not want to be subject to a high every time you treat yourself with the therapeutic effects of marijuana, then CBD is what you’re looking for. Pure CBD products that contain no THC (and therefore no psycho active component) can provide many of the same benefits of marijuana but will not affect your mind or mental state. Because they are legal in most places as well, they are much easier and less stressful to acquire. What’s the main benefit of vaping CBD? In a word: bioavailability. Bioavailability basically refers to the amount of a substance that is biologically available to the body. In other words, when you introduce it to the body, it enters the circulation rather quickly. Thus, it is able to have a more noticeable and quick acting effect. The standard way to measure bioavailability is in percentages. It is the amount or proportion of a substance that will actually be able to have an effect on your brain and body. The bioavailability of CBD depends heavily on ingestion method. It can also also differ from person to person. If a person ingests CBD orally, the amount of active substance that actually reaches your bloodstream and is able to act upon it is only around 15 percent. However, when a person chooses to vape CBD, the bioavailability skyrockets. In this case, a whole 50 to 60 percent of the CBD enters the bloodstream and is ready to get to work. Thus, when a person vaporizes CBD, it is able to enter the body through the lungs and then quickly circulates through the blood stream. When a person takes CBD in other ways, like ingesting it orally or rubbing it onto sore muscles, the bioavailability is much lower. For example, if a person swallows a CBD pill, the CBD must first pass through the gut and liver before it hits the blood stream. Thus, it takes a little while for the CBD to have an effect. And by the time it gets to that point, the digestive system has filtered out some of the potency and the active chemicals. The body digests the CBD just like food and the other things you consume. In addition, during this process, the liver enzymes break down the concentration of bio active compounds. The official name for this step is the first pass effect. So when the CBD does finally make its way to your blood stream, it is both less powerful and has taken a relatively long time to get there. And that’s why many people choose to use a CBD vape pen. When you use a CBD disposable vape pen, it bypasses the first pass effect entirely because the lungs deliver it to the blood stream through a more direct method. The CBD is able to deliver the desired results in a faster and more efficient way.